Mikaela Straus was perhaps born to be a star. 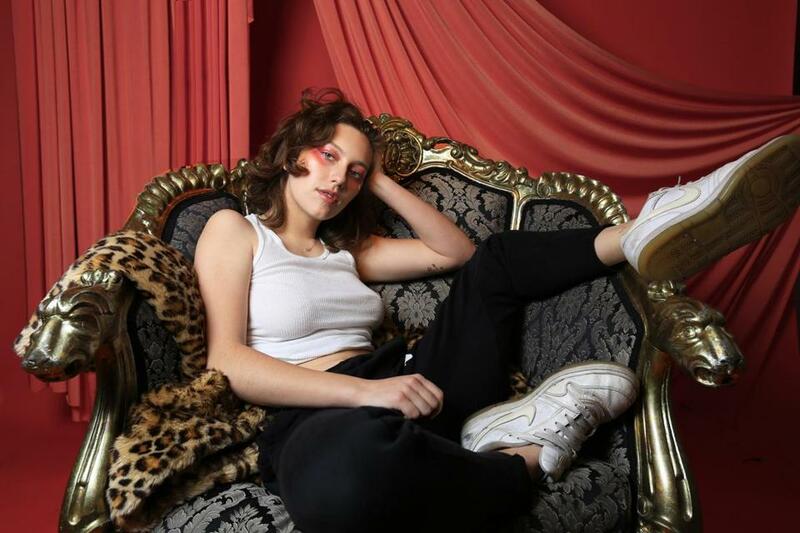 The pop ascendant, better known as King Princess, literally grew up in the studio; her father owns Brooklyn-based Mission Sound and let Straus loose to play — with instruments and equipment, yes, but also innumerable high-profile musicians who’d come in to record. Her musical talent was so obvious from a young age that she’d often be called in to contribute background vocals. By 11, Straus had been offered her first record deal; she didn’t take it, instead completing school and attending the University of South California in Los Angeles for a year before leaving to pursue music. Those teenage years gave the self-described studio rat all-important room to grow into her own person, says Straus, speaking by phone from Los Angeles. Independence in all forms has long been a prerogative for the singer-songwriter/producer; that’s reflected in songs she wrote at college, from anthemic “1950” (her breakthrough first single) to raw-nerve breakup ballad “Talia.” Both, like their creator, are directly, decisively queer; they’re also slickly produced and wildly catchy, so much so that über-producer Mark Ronson made Straus the first signee to his Zelig Records imprint after hearing them. His confidence proved well-placed. After “1950” dropped last Februrary — earning an unexpected cosign from Harry Styles — King Princess spent the rest of 2018 moving at warp speed, releasing five-song EP “Make My Bed” in June and recording her first full-length, due out early this year. Along the way, Straus found love with actress Amandla Stenberg, headlined her first tour (she hits Royale for a sold-out show Friday, then returns in May for Boston Calling), and became a gay icon in the year Twitter declared #20GAYTEEN. And to cap it all off, in December, she turned 20. Q. You’re called a queer icon and compared, with some regularity, to musicians like Troye Sivan, Kehlani, and Hayley Kiyoko, among others who explore queer identity in pop songs. What’s that like, especially at such a young age? A. Well, I feel successful! [Laughs] The way I rationalize it . . . is like, if that’s what these kids need, if it brings them joy to call me a “queer icon” on the Internet, then 100 percent [expletive] do it. I wish I had a gay icon. This is a new generation of kids who have queer people to look at and be like, “I want to be like them one day.” We had straight people who were our gay icons, and we adored them, but there weren’t really a lot of gay people who were hot, out, and loud. In that sense, of course, if it makes these kids happy, I feel like I’m doing something of importance. Q. What pressures accompany that? A. I don’t speak for the whole queer community. I speak for white women from Brooklyn who are lesbians. I don’t have the perspective of the world — do you know what I’m saying? I have no right to speak for the entire queer community, which just means we need more people, especially more queer women of color. I don’t speak for that percentage of people, and I don’t want to, because I don’t think I should take up the entirety of the room. Q. And it does feel like the door is increasingly open for queer artists to enter the room, though some more than others, as you’re saying. What do you think is behind this shift toward not only more queer voices in pop but wider acceptance of them? A. We’ve always had this amazing way of marginalized people finding their place in a pop sphere, but until recently it’s been on the terms of someone allowing us in. Like, “Oh, we’re allowing you in; by signing you to this label, you’re part of our diverse initiative.” And that [expletive] is starting to end, and what’s happening is really talented people are moving in, not only because they’re different — and marketable because of that — but also because they’re talented and know how to work the system. A big flaw of the music industry is that we’ve been allowing people to allow us in. I don’t want to be allowed in. I want to walk in. Q. Female and queer artists often have their art reduced when critics define it using their identities as shorthand — like “female singer-songwriter” as a subgenre. And yet, representation remains crucial in this industry, and your identity unambiguously informs your sound. How do you navigate those two issues at once? A. “Women in music” as a subgenre is iconic. [Laughs] It’s this weird thing where, categorically, yes, there are female musicians and male musicians. But at the end of the day, if you’re good you’re good. Women’s place in music has been defined by men, for years. So you have to take the power back and be the brains of the operation, which looks like women becoming more independent in studio settings, more comfortable having production ideas. That is change, to me, because it’s very different from when I was a kid in the studio, and either because of age or gender, I felt like I couldn’t say what I wanted to say. My way of rebelling was learning the computer, to learn Ableton [Live] and Pro Tools, so I could become literate and men wouldn’t be doing [expletive] for me. Q. What can you say about your upcoming record? A. It’s grown-up, in a beautiful way. I listen back to my EP, and I love the production and what I did with that, but when you’re a young producer and exploring sonics, there’s a lot of room to grow from project to project. This new record is definitely a step up, production-wise. The content feels really expansive in the way that, when I was younger and writing music, I wasn’t able to write a body of work that moved through a story in the same way I am now. I’m really proud of the structure of the record, how it tells my narrative. Interview was edited and condensed. Isaac Feldberg can be reached at isaac.feldberg@globe.com, or on Twitter at @isaacfeldberg.